One day a few months back my friend Oliva asked a question about blogging conferences. The wall of the Facebook group filled with responses, starting a long thread of a conversation. Women mentioned the conferences they had attended in the past and ones they hoped to attend in the future. They discussed what they had liked about the conferences they'd been to and what they found lacking. Cost, speakers, faith-based or not, break out sessions, meeting other bloggers face-to-face - we chatted about all of it and it was really interesting. And then someone mentioned that what they really wanted from a blogging conference was something small, intimate, 20-maybe-30 women. Laid back, low key. No swag bags, nothing fancy, and a nice, low, affordable cost. Fun but informative, with plenty of opportunity to chat with and learn from one another. Sandwiches for lunch, spiked coffee as pick-me-up in the afternoon. Being surrounded by women who blogged and were Catholic and didn't think there was anything weird but everything wonderful about both those things. Funny enough, there were a lot of women who wanted the same thing and by the end of the day Olivia's question had produced several regional blogging conferences for Catholic women. 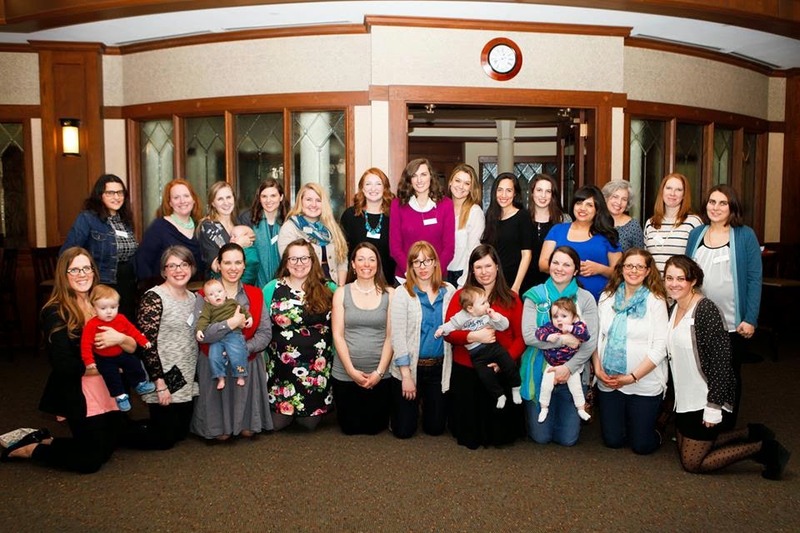 Last weekend was the first one, held at Notre Dame University, and filled with women from Iowa, Michigan, Pennsylvania, Missouri, Illinois, Indiana, Wisconsin, and Minnesota. It was great. So, so great. Katrina from Cedars and Tiny Flowers did most of the heavy lifting for the event, with a little help from Ana at Time Flies When You're Having Babies and the aforementioned Oliva from To the Heights. So mad props to them! I was supposed to emcee the day, didn't realized there was a time zone change, and walked in 30 minutes late instead of 20 minutes early. oops. We began with a prayer and then Rhonda took it from there, sharing lots of great graphic design tips. And then we all lined up for lunch, chatting and looking fabulous the whole way. A friend of Katrina's offered to decorate for us and her touches of beauty and Spring were so appreciated! My new pink shoes photobombed the spread. One of the ways we kept costs low was asking ladies to sign up to bring a dish. Costco provided the salads and sandwiches and then sweets, fruits, and hummus all came from the attendees. It was so cool meeting all these women whose blogs I read. What a thrill. Lots of group photos and selfies were taken, of course. You can find the selfies under #CWBNIndiana. There was plenty of time for chatting and sharing ideas and encouragement with one another. And it was a really special treat for me to look around a room and think, "I read her blog, and her blog, and her blog, and her blog." All those women who usually live in my computer were right in front of me! After lunch Nell from Whole Family Parenting did a great presentation on social media and building relationships with brands. She nailed it and did a great job talking about the importance of supporting one another as bloggers. There were also lots of babies and random diaper changes. And I loved it. I loved that there were women who were pregnant, others who were nursing, others who are hoping to conceive, and others who were single. All these women, coming together not as mothers, but as women, with no judgement, only love. When Nell was done with her talk Kathryn from Through a Glass Brightly presented, challenging us to baptize the secular in our writing. She was funny and intelligent and did a fabulous job. Then we chatted. We sat and shared. We talked about why we blog and the focus of our blog. Some of us went back to the classroom and gave one another feedback on our blogs. We closed in prayer and then most of us headed off for dinner out on the town. And to prat at the grotto. It was such a great day, and if you were one of the women who attended: thank you! It was such a joy being with "my people"! I want you all to know (if you all even read this, who knows) that you doing your thing and being so authentically YOU is so inspiring to me. Your writing, crafting, blogging is making a difference. Thank you! Way to go, making it all happen! This sounds so wonderful! I really wish I had known about it, I am only a short drive away. Hope this happens again soon! Sorry you missed it! It might not happen again soon, but maybe next year! Hope you can join us then! How about a conference for non blogging moms now, lol! What would those breakouts look like? I'd love to see the grotto at Notre Dame. Looks like a great time! If you had to choose five blogs of the ones you "met" over the weekend, which five would you recommend me adding to my feedly? Geesh, that's really hard and there was a lot of variety - mommy blogs, more essay-like blogs, cooking blogs, and more. Tell me who your favorite reads are and I'll pass on some suggestions! This is such a lovely re-cap, Bonnie! I so wish I would have been able to be there with all of you, so it was fun to experience a little bit of your day together thanks to your words. I hope that it might happen again in the future! Thanks for all your work to build community among bloggers. I can't believe there's not one being organized in the Colorado area. I know there's some ladies in CO, KS, and NE who blog - but maybe not any who can put one more thing on their plate and organize one. Ahhh! Sorry about that Michele! I can't believe I did that, except I can because I was sitting on an airport floor while I was working on the post. And I didn't link Cat's blog! Must do now! so fantastic. someone needs to pull one together for the South! I know there's one in Texas and I heard rumblings of one in Florida. I loved this!! I sent virtual hugs via Rhonda! Can't wait for ours in May! Love this!! It was so wonderful to meet you and all the other ladies. I already can't wait for next year (please, let's do it again next year). Thank you for making it so fabulous! Thanks again for putting this all together! It truly was a wonderful day!! This looks LOVELY! I so wish I was there! Do you know if any of the talks were recorded? Am looking forward to the Mid-Atlantic Conference. Hey Emily. We did not record any of the talks. In all efforts to keep things low key and laid back we didn't even discuss it! ha! I kept hearing about this conference as it was ongoing, and it seems like a perfect meeting of women. Glad you all had a good time!! Where can I find out if there is a conference coming near me (Massachusetts) if I'm not on Facebook? Aww!! Just saw this!! :) :) It was so awesome meeting you, too!! We need to do this again soon! Aw beautiful!!! And ps! Your site! It looks lovely! I'm glad you ladies had such a wonderful time. There are outstanding meeting rooms available in locations all over the world, to suit a variety of different budgets. Choosing the right conference room could make the difference between success and failure, so it's well worth carrying out plenty of research to ensure you choose and appropriate place. A room full of awesomeness! So much fun!